Blessed with the airport’s sophisticated route network, Hong Kong traverllers are spoiled for choice, meaning foreign cities are making extra efforts to grab their attention, and the latest one is Guam. Joining hands with United Airlines, the sole airline flying between Guam and Hong Kong, Guam Holidays, Hong Thai Travel, Travel Expert, United Vacations and Wing On Travel, Guam Visitors Bureau Hong Kong Representative Office has rolled out “Fly to Guam”, a sales campaign to further promote the island’s tourism. 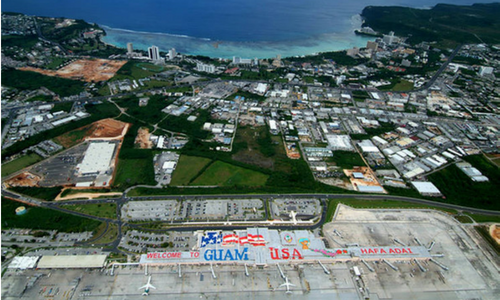 United Airlines is going to increase frequency on Hong Kong to Guam service from four-times-weekly to six-times-weekly, effective from 1 November 2018 until 28 March 2019. These new flights will fly on every Tuesday and Thursday. Also, the office will launch two outdoor events on 1 September and 8 September at Causeway Bay, where visitors can enjoy free gelato or soretto. A free sim card will be given to for each adult traveller upon any purchase of Guam travel products in September as part of the promotion. A100 strategic partnership program provides companies a holistic one-stop solution, aiming to accelerate their digital transformat.. The campaign kicked off with celebrities Lisa Surihani, Harith Iskander and Sharifah Shahirah tweeting their own calligraphed #Kat..
AIA has named title sponsor for the Chinese football reality TV show "Football Dream" Season 2 and Season 3 editions covering 2014..